Gamiani: Why you little punk! No one threatens me! Cusack: It's not a threat...[punches out a bad guy]...it's a prediction. Out of Chuck Norris' myriad of mid-to-late-80s action films, few really stood out. Most of them were pretty dim and not too terribly exciting. To a certain extent, Code of Silence rises well above almost every film Norris has made. While it's most certainly dated, it bares a distinct level of style and craft that beefs it up somewhat. I've never been a fan of Norris, but this is easily his most accessible film. Norris plays Eddie Cusack, a Chicago cop who works in a very tightly knit precinct. As the film opens, Cusack is part of an elaborate sting to capture a group of cocaine dealers. Unfortunately, some other gang has different plans and interrupts the sting by killing everyone involved, even targeting the cops. After the disaster is over, one policeman accidentally shoots an innocent boy and tries to cover it up. The massacre leads to a complex war between rival mafia members, including Luis Camacho (Henry Silva). Cusack finds himself in quite a few awkward positions: he has to try and protect an innocent member of one of the crime families, but he's also faced with dealing with this internal shooting problem in the department. Code of Silence certainly won't win awards for its story, which is fairly dim and serves only to forward the action. It can't be faulted for this, though, since the rest of the movie is pretty much what you'd expect. The action sequences that pepper the film are a lot better and more intense than what you usually see in films from this period. Chuck Norris manages a more realistic performance in this film, rather than some overpowered superman (like the Missing In Action films); this helps balance things a bit. If anything really brings this thriller down, it's the extreme level of dated material, since these simplistic mafia/drug dealer thrillers really don't fly too well nowadays. What really struck me about Code was how similar in style it was to Steven Seagal's debut film, Above The Law. Both films share similar storylines and most of the actors (right down to central villian Henry Silva) are the same, filling nearly identical roles—this made more sense when I discovered that Andrew Davis directed both films. In fact, there's even a hint of Davis' The Fugitive here, also set in Chicago. I guess these similarities aren't really a bad thing, it just shows how Andrew Davis pretty much knows what he's doing with a basic action film. Code of Silence moves kind of slow, but it delivers pretty much everything you'd expect from a Chuck Norris vehicle, only directed and crafted much better. Image Transfer Review: The anamorphic, widescreen transfer here is very nice, clean, and very colorful. Despite a few speckles and scratches, the source print is very clear. Colors are very vivid and accurately represented and black level is well defined and sharp. Overall, the image is extremely good, but the only thing bringing it down is that the film is very grainy, resulting in a hazy image in many scenes. The anamorphic enhancement definitely pays off here and proves that almost every film can benefit from the process. Subtitles are white with black borders and are placed about as low as they can be on the screen, but they still go into the image. The full-screen side of the disc doesn't fare quite as well as the widescreen. While it looks generally OK, the grain problem is aggravated slightly, resulting in some artifacts and pixelization. Audio Transfer Review: The Pro-Logic Mono soundtrack isn't very exciting, but it does get the job done. It's incredibly rich and dynamic for such a mix and certainly goes over well with the rest of the film. Dialogue is clear and the sound effects come across clean with good frequency response. One of the better purely mono mixes I've heard. Extras Review: Other than the original trailer, nothing else is included here. The presentation is very basic, with only a one-sheet insert and static menus. I think one of my colleagues said it best when he said that when we teased MGM about their 'collectible booklets', we didn't mean to take them away! Regardless, I don't think many people will care since there aren't a whole lot of extras that would really spice this disc up. 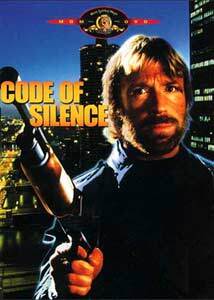 Most Chuck Norris fans seem to think that Code of Silence is his best film, and its treatment here at least is a good quality disc. Fans should pick it up, but others might want to rent it.